High on everyone’s list of subjects to photograph is the kingfisher both static and in action. This workshop is for portraits of perched birds although it is possible to obtain shots of birds landing and taking off from the perches. 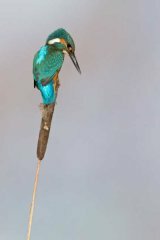 See the Kingfisher Diving Workshop for details of action photography. Due to the nature of concentrating on a single species please register your interest via the contact me page and I will keep you informed as to when the birds become regular/predictable and a date can be arranged for the workshop. This is likely to be May through to August. Equipment: I have a nice selection of photogenic perches including mossy stumps, lichen encrusted twigs, bull rushes and a no-fishing sign but if you wish to bring a couple of props of your own the birds take readily to new perches. These perches are usually set up around 6 metres from the hide. I have a great deal of flexibility at this site to move the perches closer if required but if you share the hide with others a minimum distance may be necessary. I would recommend between 400mm and 600mm (a 300mm on a 1.6 crop factor body is equivalent to a 480mm). A zoom lens is useful if 2 or more birds land on the same perch so you can pull back to get all birds in the frame.